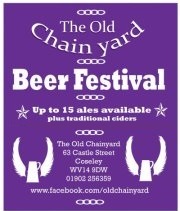 The Old Chainyard at Coseley are holding their first beer festival in 2013 as part of CAMRA’s Community Pubs Month. Hop along for what will hopefully be the first of many beer festivals at The Old Chainyard! 10 Ales from local and national breweries on racking plus 3 customer favorites including the Kinver Anvil ale available on the bar. The Old Chainyard is close the Coseley Mainline Rail station with local and National Rail accessibility.